Originally built in 1845, 56 Willow is a 4-unit brownstone co-op located in the most desirable pocket of Brooklyn Heights' fruit streets. 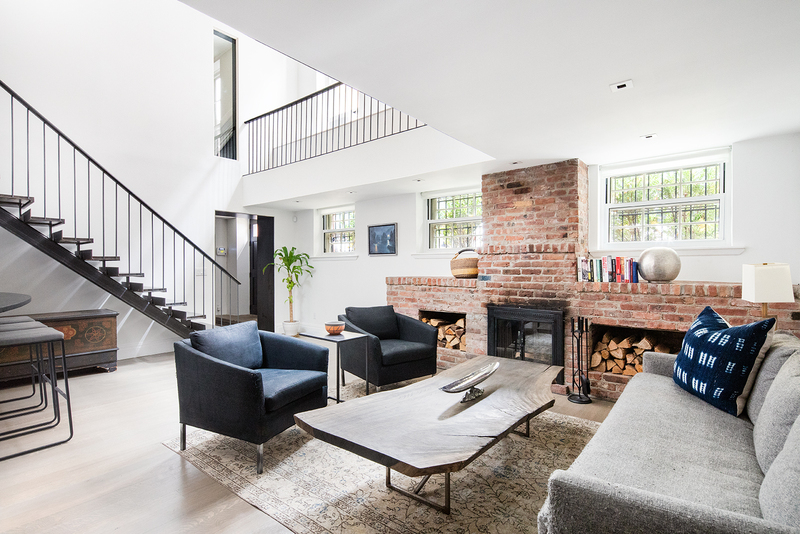 With its own private entrance setback from the main building, 9 Orange Street is a rarely available and beautifully renovated townhouse-style duplex spanning approximately 2,150 square feet, with ceiling heights ranging from 11 to 21 feet. 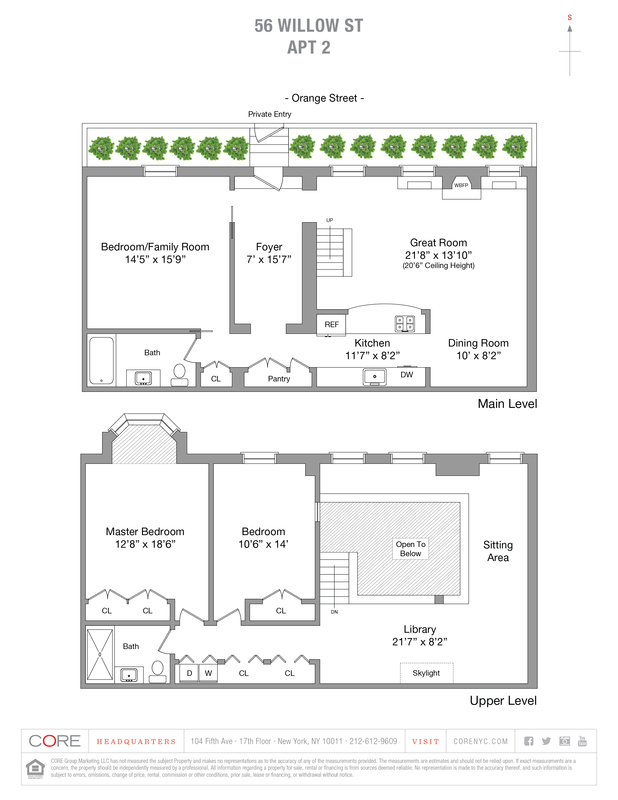 This turnkey property has both the privacy of a free standing carriage house and the volume of an open loft. Enter this magical home through a discreet private entry from the street. The stunning foyer is unexpected, massive and rich in beautiful materials such as polished concrete, bright white architectural baseboards, stainless steel sheathed doorways and gray stained oak flooring. Off the foyer is the home’s incredible great room featuring 21-foot cathedral height ceilings, a wood-burning fireplace, a brand new custom staircase, exposed brick and separate living and dining areas. Nine south-facing windows, five of which are over eight feet tall, allow beautiful natural light into the space all throughout the day. The large open kitchen is fully equipped with updated appliances, a farmhouse sink, custom shaker-style sea green cabinetry, wainscot backsplash, a massive pantry, honed black marble countertops and a breakfast bar. On the other side of the home’s main level is the 14’5’’ x 15’9’’ third bedroom, which is currently being utilized as a family room, a wall of closets clad in floor-to-ceiling custom walnut doors and a pristine guest bathroom with a shower/tub combo, a large Restoration Hardware vanity with cypress cabinetry, polished chrome Kohler fixtures and Carrara marble countertops. Upstairs on the home’s second level is the elegant master suite featuring a charming bay window and sitting area, a full bathroom with a large walk-in shower designed in a chevron pattern of Carrara marble, a custom vanity with Pietra Cardosa gray stone and white lacquer cabinetry. The second bedroom is large, south facing and adjacent to twelve linear feet of floor-to-ceiling closets with endless customized storage and the home’s side-by-side washer/dryer. To top everything off, there is a 600-square-foot wraparound mezzanine on the upper level of the home which has a large skylight, exposed brick running up the entire south wall, 11-foot ceilings and a variety of options for using the space, such as a home office, library, sitting room or workout area. One could even carve out another bedroom if they desired.